The iPhone’s lack of a front facing camera makes taking portraits quite the task sometimes, and is something that you have to have steady hands for, to say the least. Most iPhone users have run into this problem, thankfully there is an app that solves the issue by taking advantage of facial recognition technology in order to snap the photo for you when your face is frame. Self Image, available in the App Store for $1 USD, and is definitely one of the best solutions to the issue of taking portraits with lack of a front facing camera or better implementation of controls. However, there are a few other options. 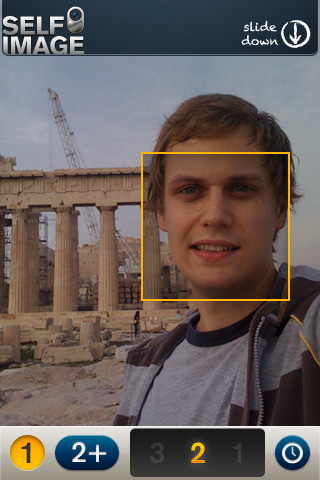 If Self Image isn’t doing it for you, as the facial recognition technology is obviously something you’ll have to try out for yourself, here are a couple more apps that try to solve the portrait issues with the iPhone’s camera. Camera Genius will allow you to set a traditional camera, a feature common in most digital cameras. Another app that will solve the problem is Fast Tap Camera which will allow you to tap anywhere on the screen to snap a photo rather than using the small on screen button in the camera app.